When you walk through Meiji Shrine, a peaceful oasis of green in the middle of Tokyo, your pulse rate drops and you forget the hustle bustle of one of Asia’s most dynamic mega-cities. Its location next to the National Stadium for the 1964 Tokyo Olympics and the Olympic Village made the wooded park of Meiji Shrine a wonderful place for runners to train, a la middle distance double gold medalist, Peter Snell. When images of the planned National Stadium for the 2020 Olympics were released, there was a mixture of groans and puzzlement. Globally renown architect, Zaha Hadid, presented a design of sleek modernity. Frankly, I thought it looked like a bicycle helmet, somewhat out of place in its surroundings. Then suddenly, in July, 2015, Prime Minister Shinzo Abe scratched plans for the design of the new National Stadium planned for the 2020 Tokyo Olympics. It was revealed that the estimated cost of the stadium ballooned from JPY252 billion, from the original proposal of JPY130 billion, an approximate difference of USD1 billion. Scrapping Hadid’s design meant a massive delay, resulting in a particularly embarrassing broken promise. Plans to have the new national stadium host the 2019 Rugby World Cup also had to be scrapped, resulting in a move of the tournament to Yokohama. TOCOG quickly put together another search for a stadium designer. And suddenly, Kuma Kengo, whose design was selected, was in the spotlight. Not only will the cost of the Kengo stadium be closer to the originally proposed estimate (JPY150 billion), the design of the stadium will more seamlessly blend into the environment. Instead of the old-fashioned idea of putting up a huge monument, my idea is to create a stadium that people will remember as part of the Meiji Shrine outer gardens, the wooded area in which it’s located. And we’re planning to uncover the Shibuya River, which was put underground during the rapid-growth years, and have it flow at surface level through the stadium grounds. I believe that creating something sustainable for future generations, with the surrounding nature open to the public, is a more important considerations than the physical shape of the edifice, and so that’s what I’ve been focusing my efforts on. Kuma’s approach is perhaps best illustrated by a series of buildings he has built in and around a small town called Yusuhara on Japan’s southern Shikoku island. The Yusuhara Town Hall (2006) sits under a roof and frame of Japanese cedar in a traditional structural arrangement, but one that gives off more than a hint of high-brutalism in the strong articulation of its thick beams and columns. The outside features a series of timber panels of various dimensions, alternating with glazed panels – a genuinely interesting take on the “barcode” facade. 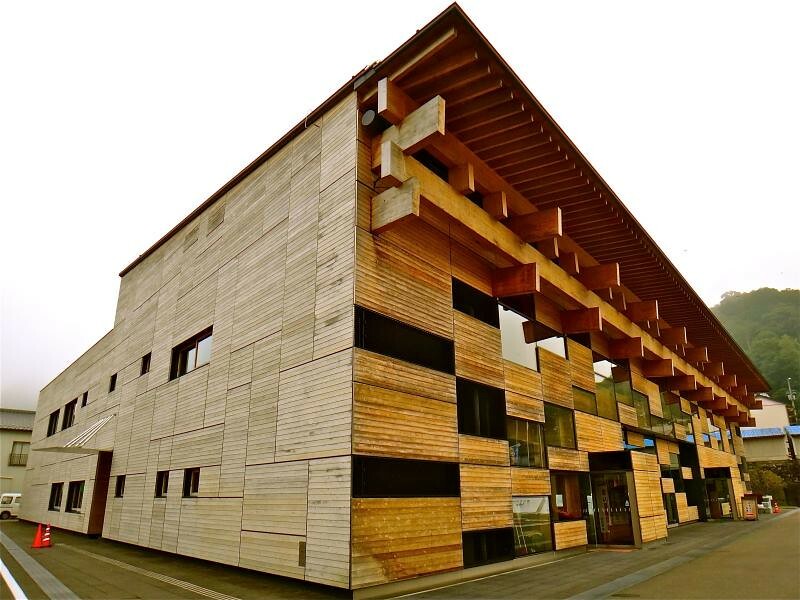 A small hotel and market (2010) that Kuma built nearby is just as unconventional, with a curtain wall on the main facade made of straw bales and bamboo that can actually be opened out to allow light and ventilation through – a very odd combination of rustic material and hi-tech detailing. But the wooden bridge building (ICON 101) that Kuma built over a road to link a spa and hotel on the outskirts of the town is stranger still. Here is a version of traditional Japanese roof construction blown up to super-large scale, a series of single wooden elements all overlapping and stepping up towards the bridge itself. It is this radical re-imagining of a historic building material or method of construction that one sees time and time again in Kuma’s work. I’m truly excited for the debut of Kengo Kuma’s national stadium. I feel it will not only be appreciated for its uniquely Japanese sensibilities, but will be a lasting legacy of the 2020 Games, a fitting complement to its green surroundings, particularly the peaceful Meiji Shrine. Posted in Business, Economics, Environment, Japan, Pop Culture, Tokyo 1964, Tokyo 2020, Tourism, Track and FIeld and tagged 2018 Rugby World Championships, Kengo Kuma, Meiji Shrine, national stadium, Peter Snell, shinzo abe, Yusuhara, Zaha Hadid. Bookmark the permalink.